It’s possible to see many highlights of the Lake Myvatn area in one day. On our two week road trip, we spent a day and a half in the Myvatn region of northern Iceland. After stopping in the bohemian village of Seydisfjordur, Justin and I drove to Skutustadir Farm Guesthouse, our home for two evenings. We prepared a meal and mostly relaxed once we reached Lake Myvatn. That left us with one full day for exploration and adventures during our time there. You can easily see these attractions all in one day, provided that you have a vehicle to get around. We suggest renting a car in Iceland and making your holiday into one giant road trip. 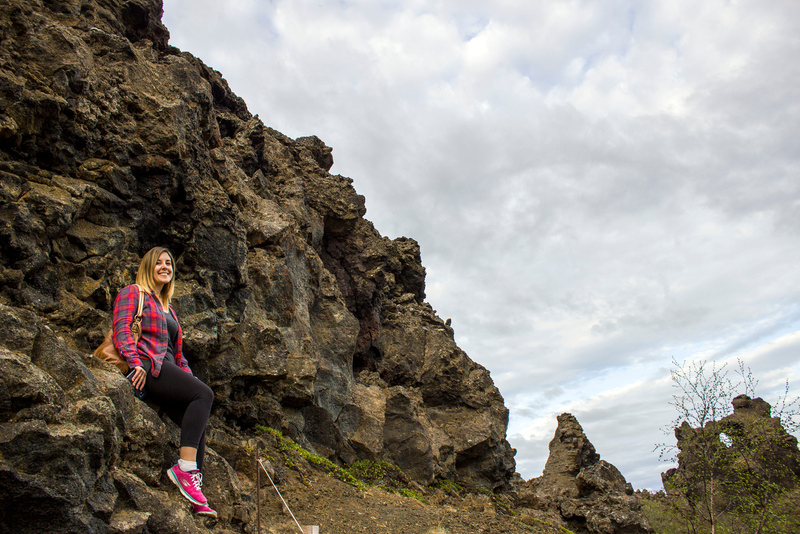 Here are the top 6 things to do in Myvatn Iceland. If you’re travelling beyond Myvatn or the north, check out this list of things to do in Iceland. Do you have any other recommendations for the Lake Myvatn region? Where would you most like to visit? 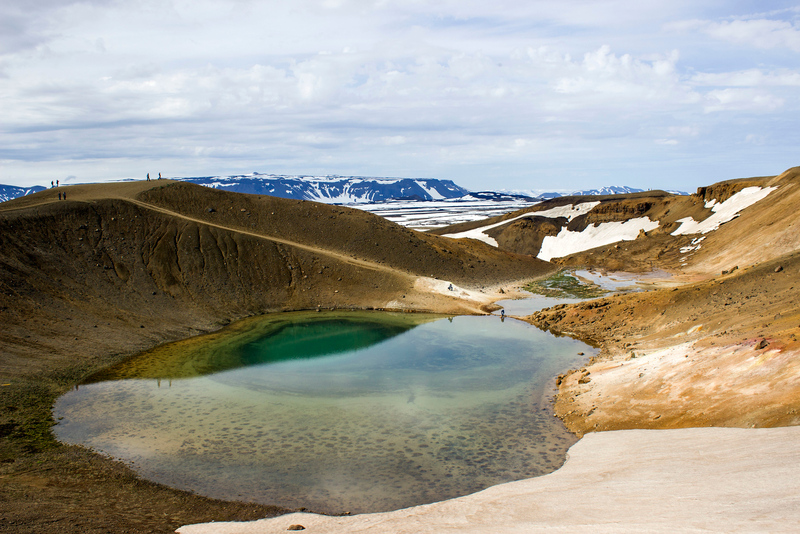 With its intriguing and otherworldly landscape, a trip to Namafjall Hverir is something you must do in Myvatn. It’s a quick stop off the Ring Road just outside of Reykjahlíð. You can’t miss it – you’ll see a landscape that looks similar to Mars. Upon closer inspection, you’ll notice vents letting off steam and bubbling gray mudpots on a green, orange, and gray speckled ground. Allow yourself about an hour to wander around the site, marveling at the fumaroles and snapping lots of pictures. We visited this area in the early evening once the tour buses had left. In early June, the sun barely goes down and it doesn’t ever get completely dark. 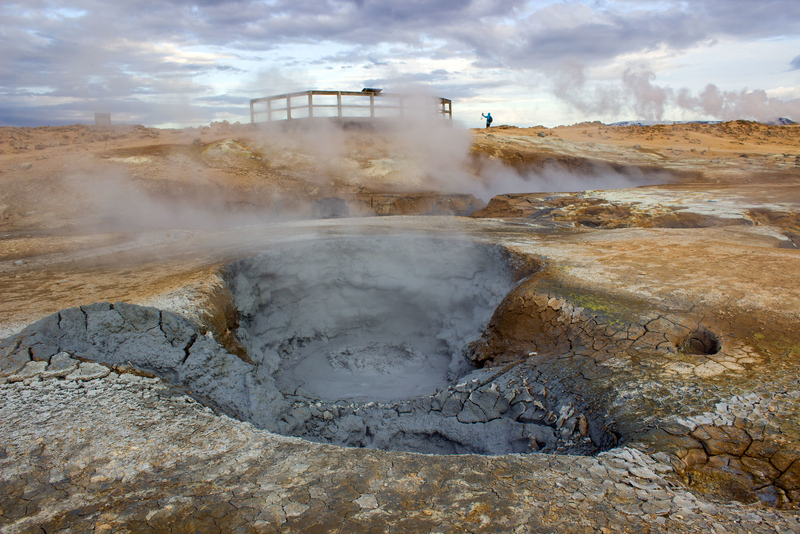 Namafjall Hverir has no entry fee and you can visit this natural phenomenon any time of day. For more details, please check out my full article about Namafjall Hverir. Traveling from the east towards Lake Myvatn, you’ll see the parking lot right off the Ring Road before you enter the small town of Reykjahlíð. 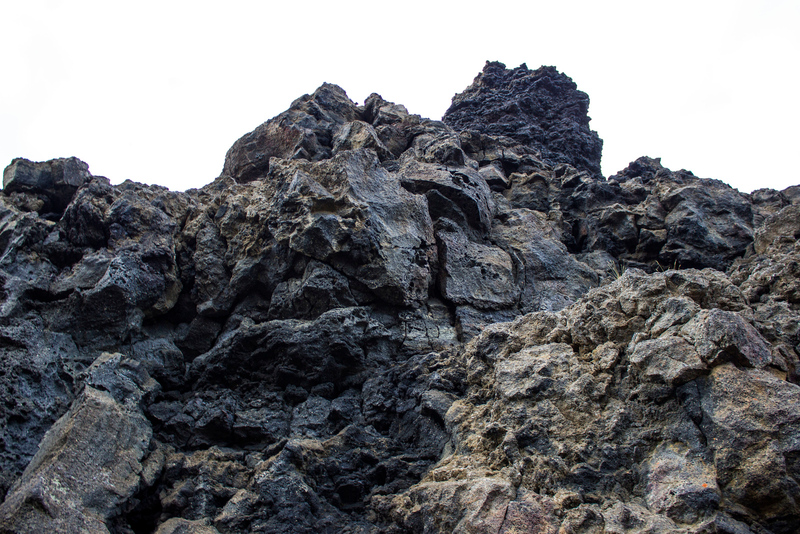 At Dimmuborgir, you’ll see some fascinating rock formations created from solidified lava. 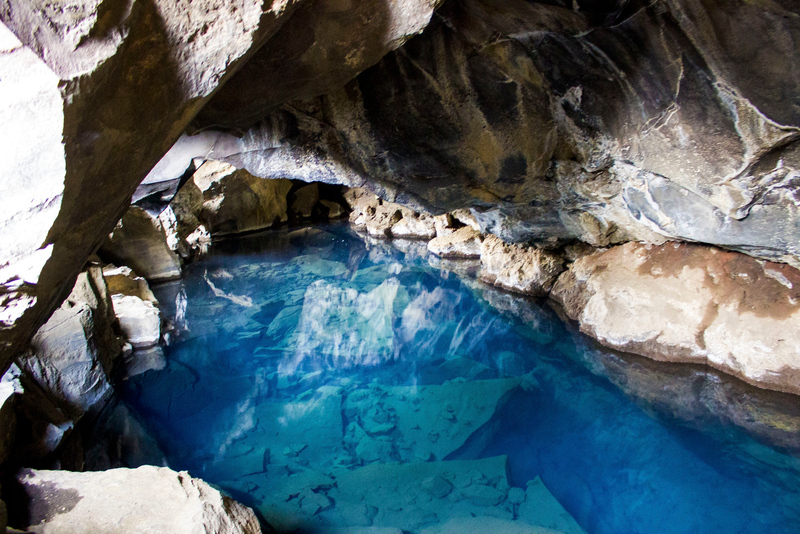 Over 2000 years ago, a lava tube collapsed and the lava flowed over a small lake. The water of the lake began to boil and the steam rose to form lava pillars. 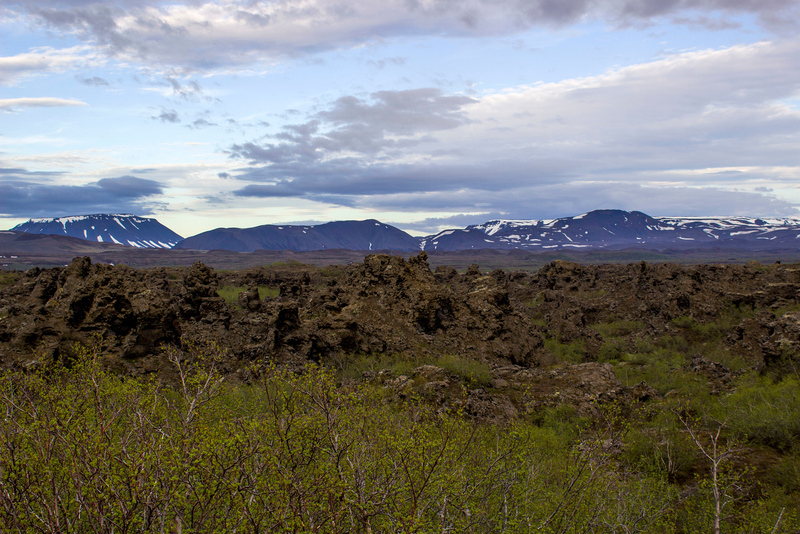 Although the top crust collapsed, hollowed tubes, chimneys, and pillars of solidified lava still remain. The only other formation like this one in the world is under the sea off the coast of Mexico. There’s really nothing like Dimmuborgir on the planet. Dimmu means dark and borgir means cities, forts, or castles. There are many hiking trails here, both shorter and longer stretches of paths. You can spend between 30 minutes and an hour here, depending on how far you’re interested in venturing. Dimmuborgir was featured in an episode of Game of Thrones in season three as a location beyond the wall. 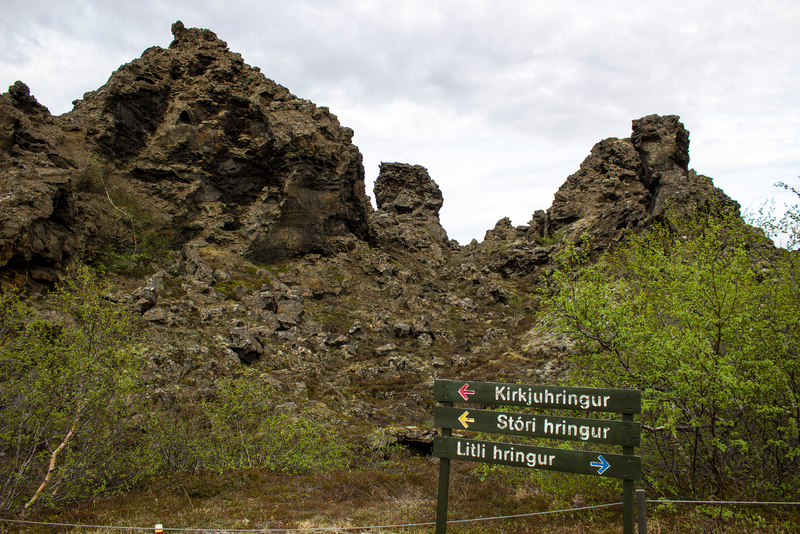 From road 848 (the one that runs around Lake Myvatn), turn at the entrance to Dimmuborgir. You’ll find the parking lot at the end of the road, along with a small cafe. Grjótagjá is a small cave that’s near Dimmuborgir. There’s a small parking lot just outside the cave. 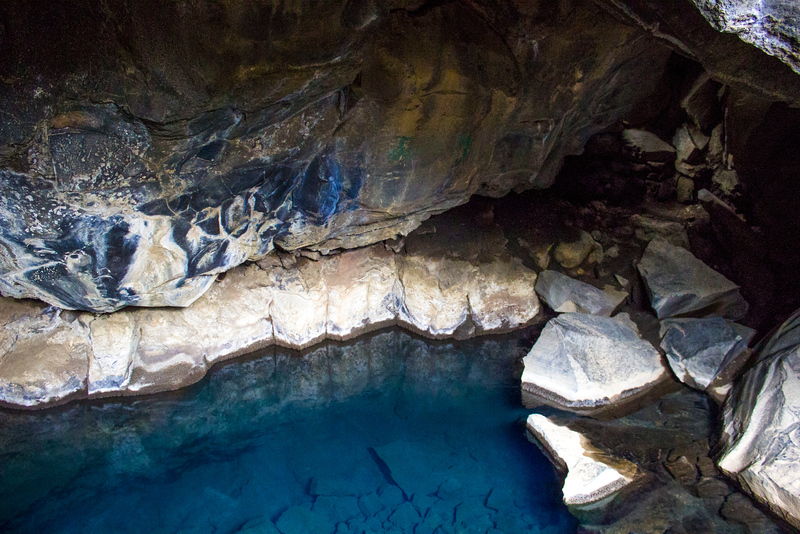 Climb down into the cave to witness the vivid blue waters. It used to be a popular bathing spot until the 1970s when there were volcanic eruptions. The temperature of the pool rose to 50°C (122°F), though it’s steadily declining. Even though it may be at a temperature that’s now suitable for bathing, the landowners ask that visitors not bathe there. There’s a large sign outside the cave for this purpose. 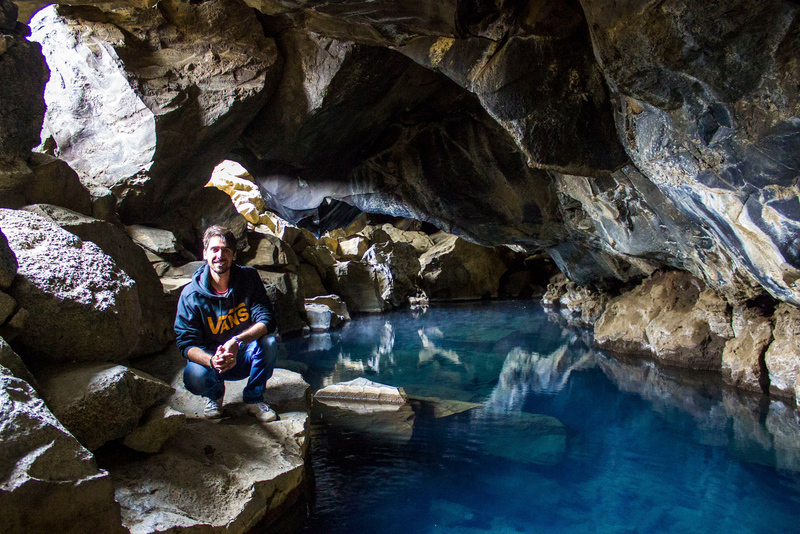 Although Grjótagjá is on private property, the owners encourage everyone to check out the cave for both exploration and photography purposes. Another Game of Thrones scene was filmed here, too. From Rte 1, turn south on road 860. You’ll arrive at the parking lot of the cave. 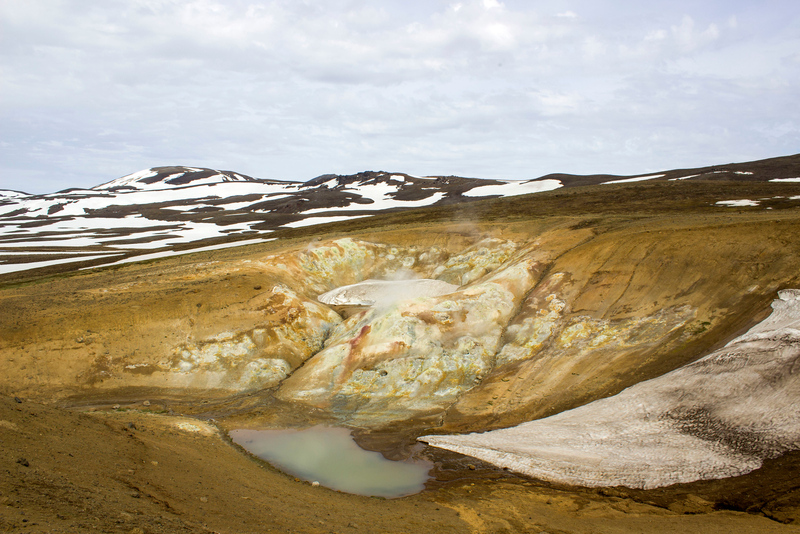 Krafla is a caldera, a cauldron-like depression in the earth following eruptions. 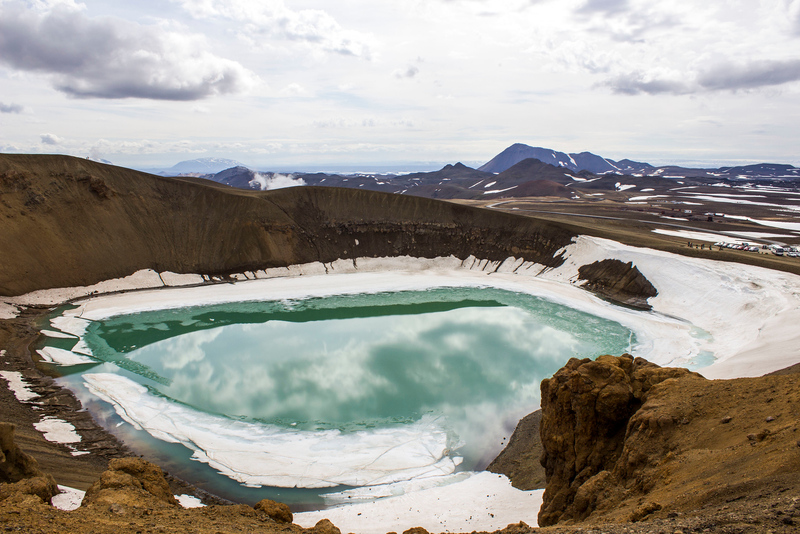 At Krafla, there’s a Viti crater with a surreal green-blue lake inside it. 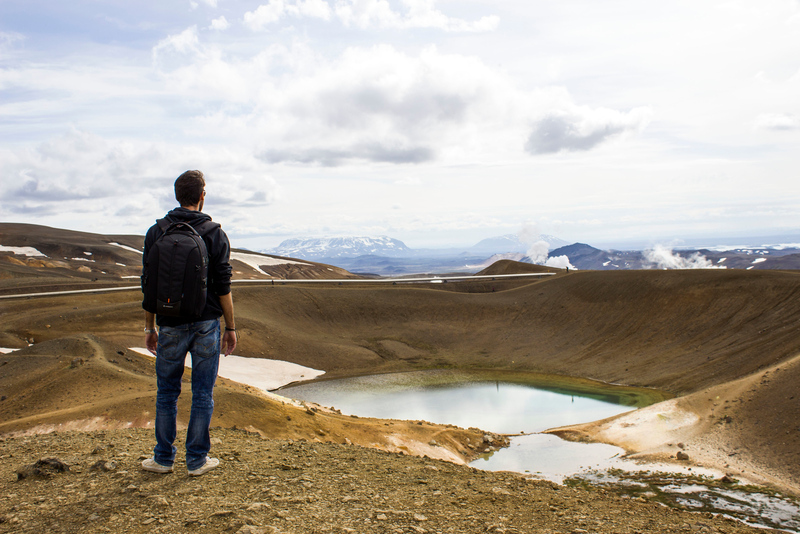 You can walk around the circumference of the crater, admiring the lake from many angles. There’s a colorful landscape here with steaming vents and an additional smaller lake on the other side of the Viti crater. 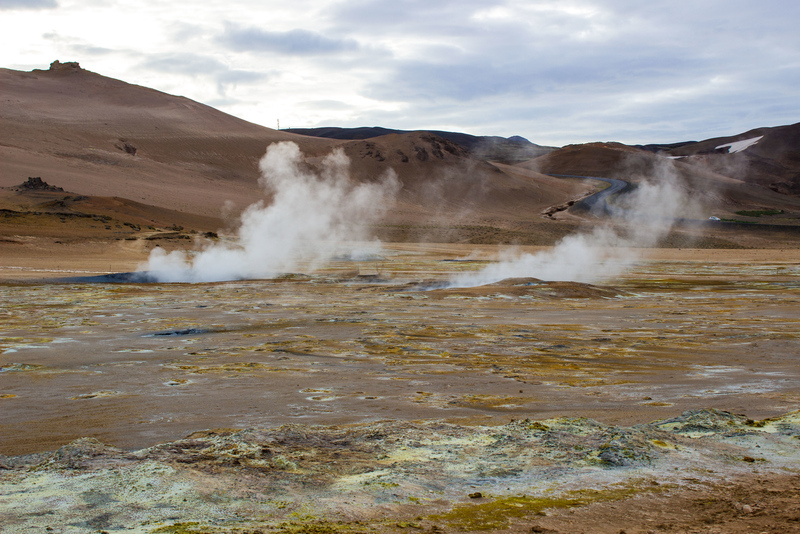 Visiting Krafla was one of my favorite things to do in Myvatn. It’s also featured prominently in our video, Iceland From Above – Incredible Drone Video That Will Give You Instant Wanderlust. From Rte 1, turn to a road with a sign marked for Krafla. The road is near Namafjall Hverir, on the opposite side of Rte 1. 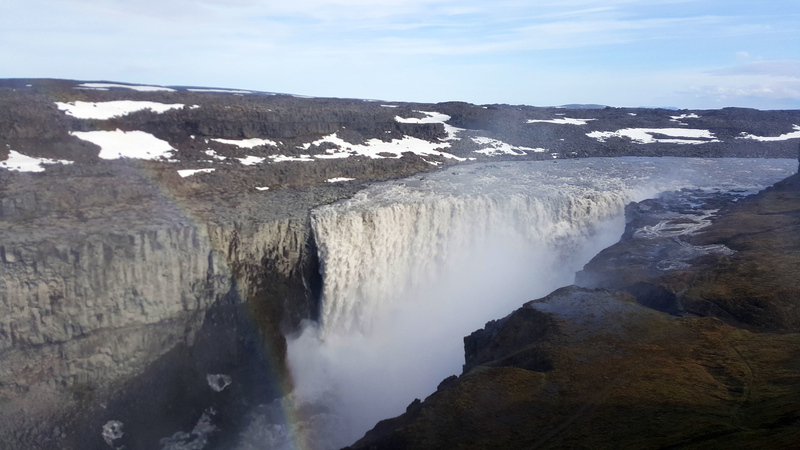 Dettifoss is not only a stunning waterfall, but it’s also the most powerful one in Europe. It is a massive waterfall at 100 meters (330 feet) wide and a drop of 44 meters (144 feet). The water flows from the Vatnajökull glacier. There’s a path that leads to a closer observation deck, but be prepared to get wet! We had no idea that the mist was so intense. We were not daring enough to bring our cameras out for long, and I’m glad we wore rain jackets. 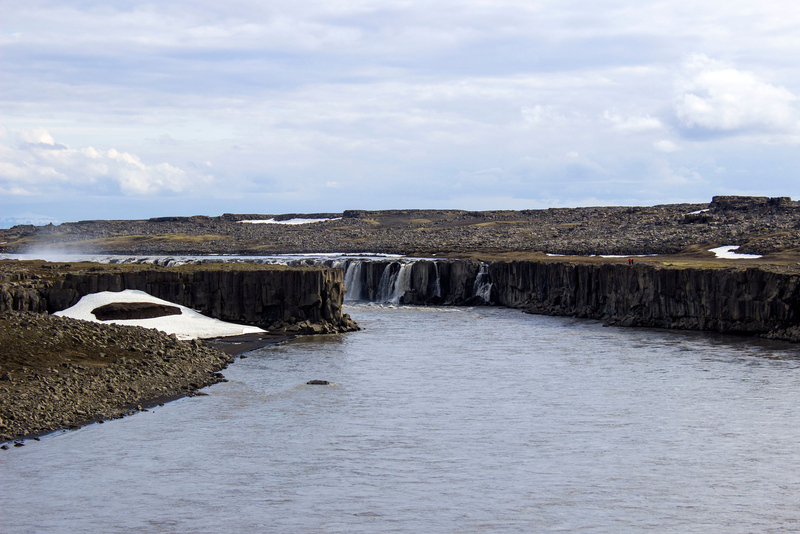 There’s a second nearby waterfall, Selfoss. 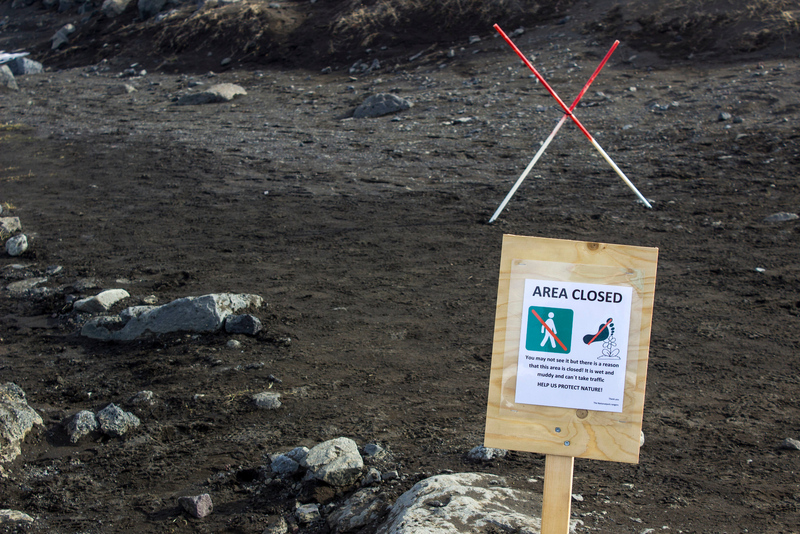 Unfortunately, the trail to Selfoss was closed as to not destroy the path itself. 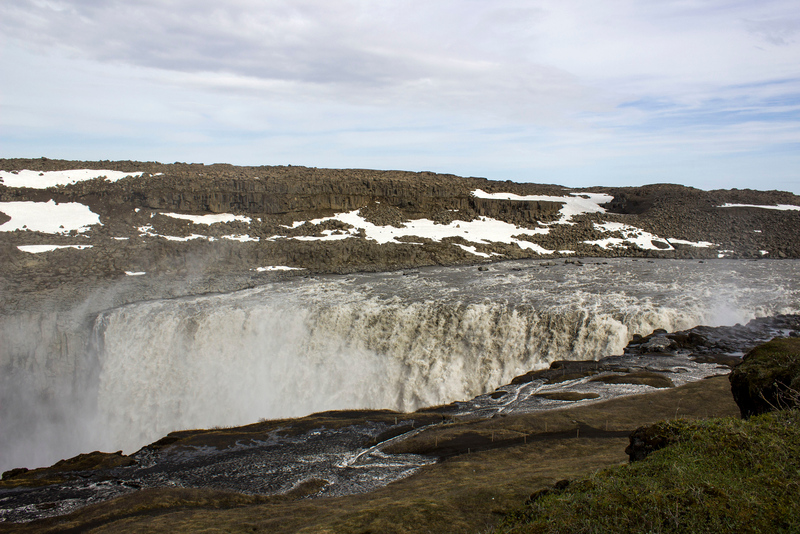 Perhaps when you visit, it will be less muddy and you’ll be able to trek out to Selfoss. Sign on the path preventing our hike to Selfoss. 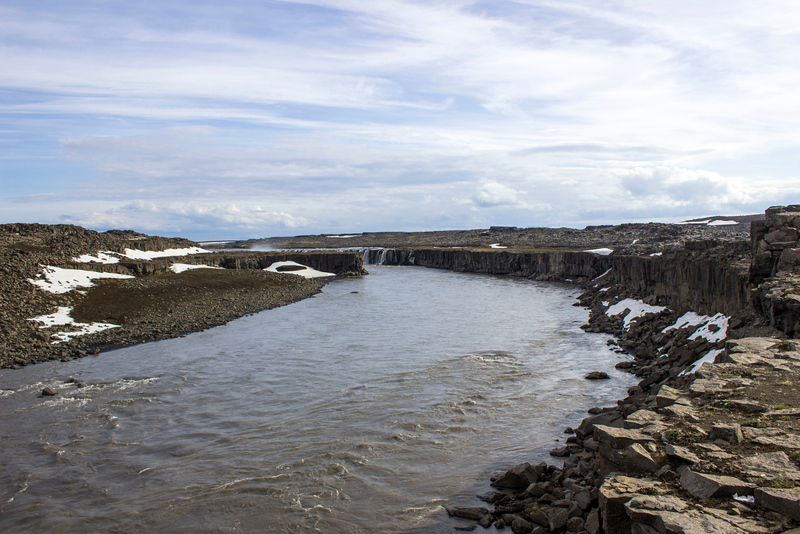 From Rte 1, take the paved road 862 and follow the signs to the Dettifoss parking lot. 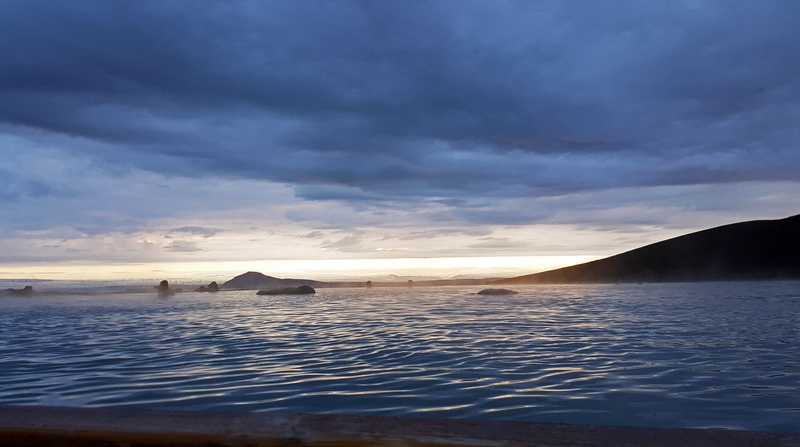 After numerous adventures, we ended the day by relaxing at the Myvatn Nature Baths. 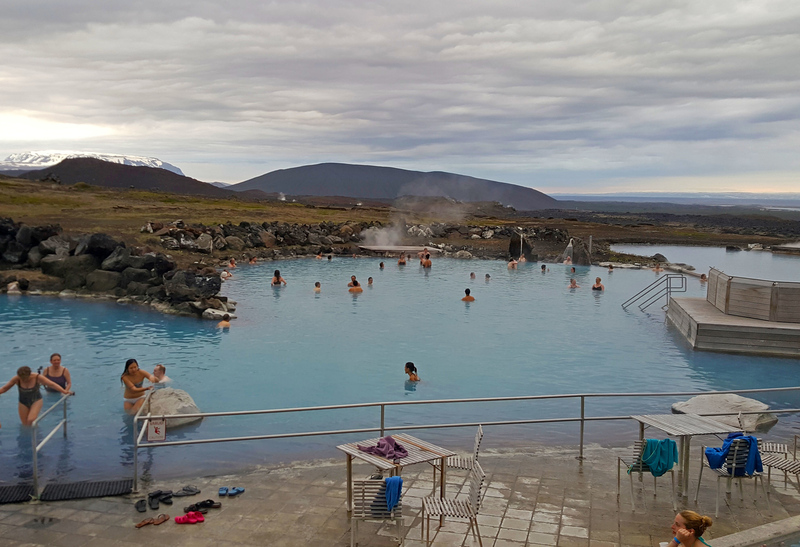 We opted visit the Myvatn Nature Baths in place of the Blue Lagoon. Why? It worked better with our schedule. We really couldn’t fit in any time to go to the Blue Lagoon with our travel plans. However, the Myvatn Nature Baths were a suitable substitute, and might even be better than the Blue Lagoon. Unlike the Blue Lagoon, you don’t need to book your visit in advance. An adult ticket ranges from 3500 ISK to 4300 ISK depending on the season. The baths are super relaxing and invigorating. I recommend visiting later in the day as it wasn’t very busy at night. It was still light outside and we watched the sun slowly lower in the sky. 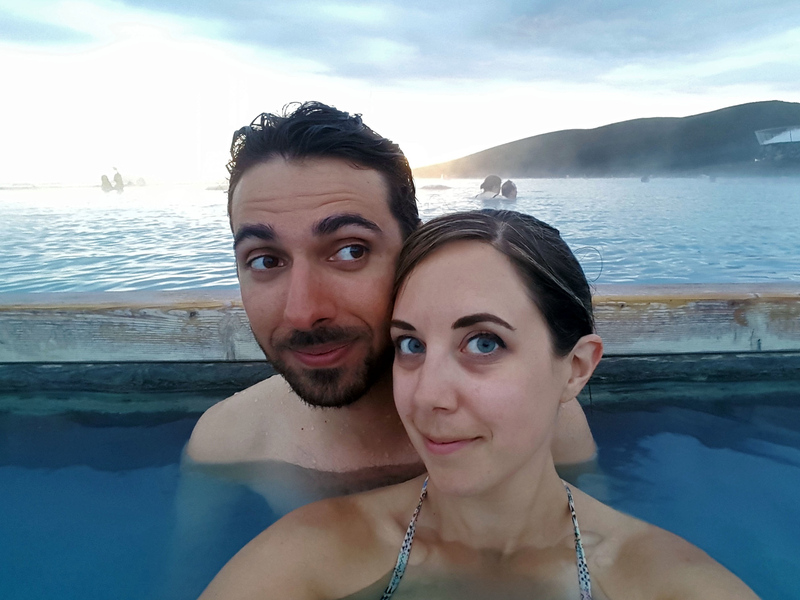 After a soak in this man-made mineral lagoon, we felt fantastic! My skin felt so soft and I felt very calm. 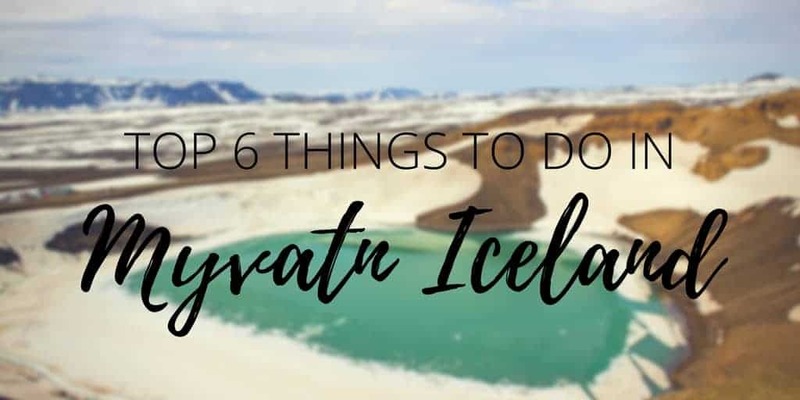 So, I’ve named my top six things to do in Myvatn Iceland, but I have another bonus entry to add to that list. Take a drive around Lake Myvatn itself. You’ll see a spectacular landscape dotted with psuedocraters. These small craters formed thousands of years ago in steam explosions when lava once flowed over a lake. Want to see more photos? Check out my entire travel photo album of the Myvatn region! 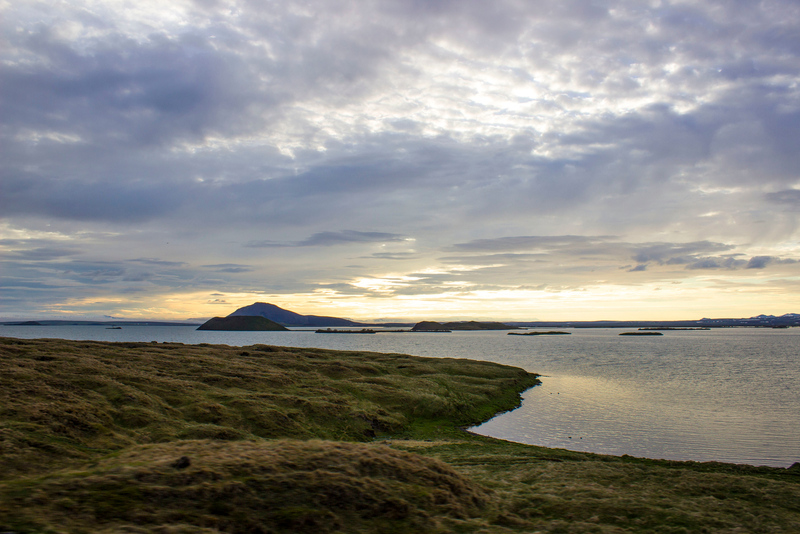 Be sure to rent a car and incorporate these adventures in the Myvatn region to your Ring Road travels. Check out sites like Expedia for hotels in Iceland. I highly recommend choosing hotels, accommodations, and guesthouses with kitchenettes or kitchen facilities so you can make your own meals. We cooked vegan meals on the go by purchasing ingredients at the grocery store, and I created fairly effortless dishes like pasta and wraps. It saved us a lot of money and also made it easy to maintain a vegan lifestyle. 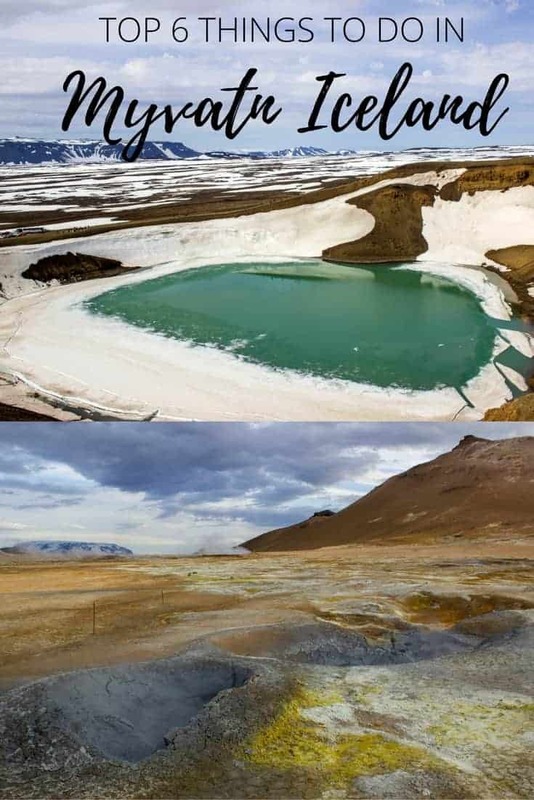 Want to know some more travel tips about Iceland? Check out these important things to know before you travel there. PIN this to your PInterest board for future reference! Click the top left corner. Pinned! So excited to learn about another “Blue Lagoon” that isn’t as touristy or pricey. Although I still wouldn’t mind hitting up both! #WeekendWanderlust Happy Holidays! Iceland is truly a photographer’s dream! 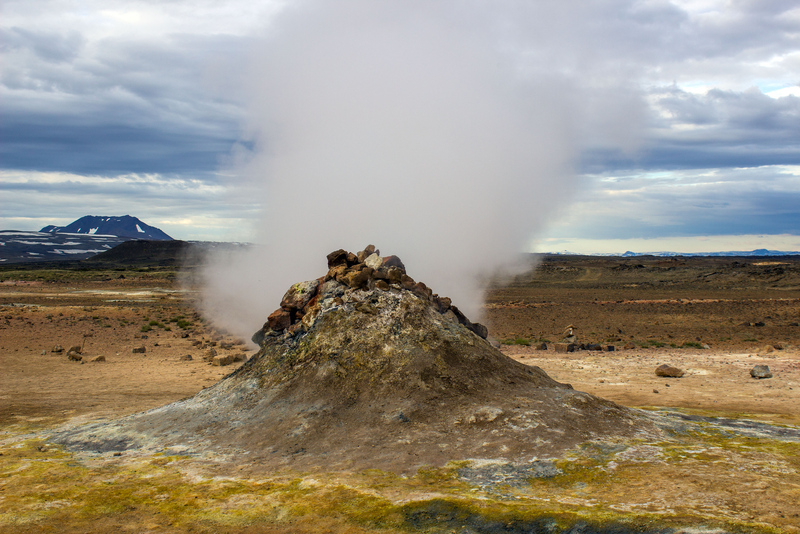 I love the photos of the different landscapes and crazy geysers! I’m hoping to head to Iceland soon so I’m pinning this, along with your other Iceland posts, to help with my research! I’d really love to see all of the places on this list! It looks otherwordly! Stunning photos! Iceland is on my bucket list, will definitely note these down to check out. I really loved visiting Lake Myvatn in Iceland. In fact, I think it was my favorite part of the entire island. Doesn’t Hverir look other worldly? It is like a whole other world. I absolutely loved it too! Glad you got to visit!